A barbeque will be provided after all plantings. This wet season there are 11 community plantings to be held on Saturday mornings from the end of January to the middle of April, excluding Easter. All the plantings start at 8.00 am to allow volunteers living some distance away time to travel, and all the plantings will be followed by a TREAT barbeque, a welcome end to a morning's work. As usual, TREAT is relying on members' and the public's enthusiasm for tree planting, to come to these community plantings in enough numbers to make each morning a rewarding experience for a couple of hours, rather than a drawn-out affair. We are assured of assistance at some of the plantings from students at the Centre for Rainforest Studies. They incorporate tree planting into their curriculum as both education for the students and help to the community. For newcomers to tree planting we have hand-out information on how to plant a tree, sandwich boards picturing the basics, and there are always experienced volunteers available to demonstrate techniques and help anyone unsure of what to do. Trees planted correctly have a greater chance of survival and a higher initial growth rate. Each planting is different. Variables include weather conditions, soil type and whether the area for planting is ripped or/and holes are dug. Sometimes holes or rip lines can be shallow and need to be scooped deeper to ensure a tree's roots will not be exposed when rain washes soil away. This takes extra time. Over the years, lessons have been learnt about 'site preparation' and most plantings are fairly straightforward. Funding assistance has this year come from the Australian Government's Caring For Our Country funding of Open Grants, Reef Rescue Grants and Community Action Grants (CAG). This planting on Brad and Kim Eaton's property is part of the Wet Tropics Management Authority's (WTMA) Caring For Our Country project to increase and reconnect habitat in high-altitude areas for resilience to climate change. The planting will connect existing habitat on the property via a gully area to a small remnant near East Evelyn Road, thereby connecting the remnant to Malaan National Park. Tree-kangaroos are regularly seen in the remnant. Site preparation is by the Tablelands Regional Council's Community Revegetation Unit with assistance from Conservation Volunteers Australia. The property is on East Evelyn Road, not far from the Millaa Millaa lookout. Follow the TREAT signs. At Massey Creek QPWS have been revegetating areas previously used for grazing but now part of the Tully Gorge National Park, to widen a section of the forest corridor from the coast to the highlands. This planting will be adjacent to last year's planting on the northern side of the road, done 14 - 15 February after being postponed due to Cyclone Yasi. Terrain NRM's Land Management Team will be assisting with some site preparation. Since 2008, TREAT have been assisting Carolyn and Philip Emms to revegetate parts of their property at Lake Barrine to expand Donaghy's Corridor on Toohey Creek, buffer the neighbouring National Park, and connect small remnants. This year's planting will fill in an area between the corridor and buffer and bring the total revegetated area to 15 hectares. The site is accessed from Pressley Road off the Gillies Highway. Look for the TREAT signs. This planting on Leo and Barbara Hofmann's property is also part of WTMA's Caring For Our Country project. It will be on the opposite side of East Evelyn Road and again connecting to a remnant. With some weed control in a forest area on the adjoining property, this remnant will be connected to the Herberton Range National Park. The property is RN 362 on East Evelyn Road, near the Millaa Millaa lookout. Follow the TREAT signs. Mark and Angela McCaffrey have been revegetating areas on their property since 2004 to link a large remnant to the Herberton Range National Park. This planting will be above the 2010 planting, close to Kenny Road, and will almost make the connection. The trees are being sourced through the Tree Kangaroo and Mammal Group. The property is on Kenny Road between Tarzali and Millaa Millaa. Look for the TREAT signs. Ian Freeman's property forms the link for the Peterson Creek Wildlife Corridor to the National Park at Lake Eacham, thus joining it with the Curtain Fig National Park. Last year's planting around a small remnant in an eroding gully has now been extended by Ian to reach the Park, a significant milestone. This planting will be mostly at areas near the creek. TREAT has obtained funding assistance from a CAG grant. Peter and Catriona Arnold-Nott's property adjoins the Malaan National Park at their driveway entrance. Last year a planting along the driveway area enhanced a small remnant and joined it to the Park. This year's planting will extend last year's planting and be on the other side of the hill. Some funding assistance remains from a 2010 CAG grant obtained by Malanda and Upper Johnstone Landcare Association. This QPWS planting is within the Curtain Fig National Park, on an expired grazing lease area (with an old road reserve) which has now reverted to Parks. The site is accessed from Chumbrumba Road off the Curtain Fig road. Follow the TREAT signs. At a field day last year at Ken and Sue Pyke's property we saw the extensive tree planting they've done for fruit harvesting, habitat and erosion control. This will be their first community planting and will add to plantings at the dam area, the source of a small creek flowing towards the Mulgrave River. Funding assistance from a CAG grant has been obtained by Yungaburra Landcare Group. The property is on Eastern Connection Road off Powley Road off the Gillies Highway. Look for the TREAT signs. This planting on Ian's property will increase the forest area adjacent to the National Park and extend the planted area from the creek. Funding assistance for this planting is from the federal government through Terrain NRM . This planting will be on another creek containing small remnants, not far from the previous plantings. Eventually the creeks will be revegetated to their junction. Reef Rescue funding assistance has been obtained by Barron Catchment Care. Barron Catchment Care has a Community Action Grant to rehabilitate an area along Mazlin Creek behind the new development on Danzer Drive, Atherton. The project will rehabilitate 1 hectare of Mabi forest which will widen the riparian area along the creek. The project is in partnership with the Tablelands Regional Council (TRC) and we will work with both Atherton State and High Schools and the local community to complete the planting of the area. The site is beside a drain that enters Mazlin Creek, and along the creek to a detention basin entrance. This is an extension of previous revegetation work along Mazlin Creek completed in the 1990s. The site was overgrown with guinea grass, tobacco bush, lantana and the odd rusted car panels (not unusual for such sites) and Terrain NRM's Land Management Team attacked it with vengeance, removing all the weeds and rusted pieces to clear it for planting. The area is part of the Atherton High School's cross country running track as well as being the play area for the local kids who reside in the area. Atherton State and High Schools were keen to be involved, with planting days to coincide with Tropical Tree Day. Although the scheduled days were hot, students fervently attended a morning of planting at the site. Atherton State School's year 5 students walked in single file, guided by the committed teachers to the site on Friday 2 December 2011. The 100 students were very energetic and eager to plant trees. They were divided into 2 groups, to rotate between the activities; rubbish collection (bottles, plastic etc.) and tree planting. The students collecting rubbish were led by Evizel Seymour and Alison King demonstrated how to plant the trees. The students rushed to their tasks. Black garbage bags were filled quickly while 200 trees were planted, watered and mulched before returning to school at 11 am. The whirlwind of children left the area to a satisfied silence where the trees can grow and be visited in future years by the children who planted them. The 120 Atherton High School's year 8 students also came with lots of enthusiasm and merriment ready to plant trees on Monday 5 December. They were divided into 3 groups: planting, mulching and watering. Over 300 trees were planted with laughter ringing through the landscape; mulch was readily placed amongst the trees followed by buckets bearing water for the newly planted trees. Amongst the jokes and frivolity, on a hot morning, a job was well done. All students must have returned to school with a huge sense of achievement. It was impressive to see how the students all worked together to get a job done. The High School teachers are very keen to continue using the site as a teaching area for the students, especially for environmental science where they can collect water quality data for analysis. The site will be still used for the cross country running track. Barron Catchment Care is also working with the schools to develop signs for the area. A competition will be run at the schools with the winning art piece to be made into signs for the site. Hopefully, this will encourage the local kids and residents to be proud of the area and take on ownership of it. The site has attracted much interest and support from TRC and Greening Australia. Gary Barnes from Greening Australia was involved in the tree species selection, as powerlines run directly overhead. 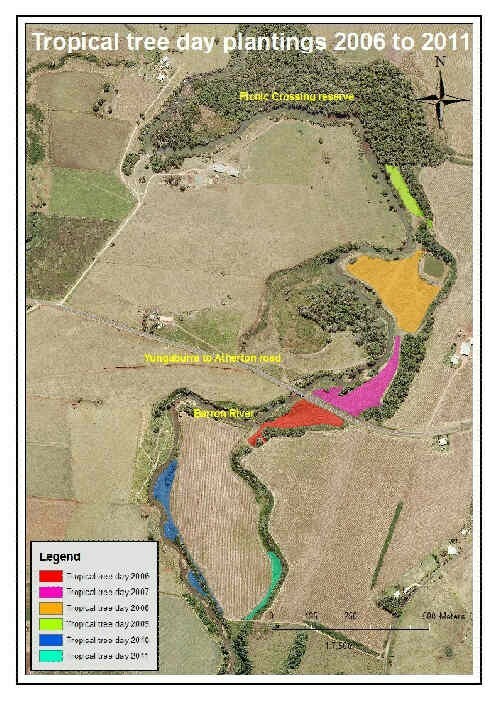 He has lodged the site into the Ergon Energy database, so they are aware of the planting and species selected, to avoid future clearing at the site. Barron Catchment Care will hold a community planting day in early 2012 to plant 500 trees, inviting all the people in the immediate area, to come and plant and get to know their own back yard. Barron Catchment Care (BCC) in partnership with TREAT for the last six years has held Tropical Tree Day plantings in early December on the Mabi flats of the Bonadio's property. The Map shows the sites planted yearly from 2006 to 2011. Approximately 30,000 trees have been planted and 12 hectares treated. Funding for the first four years came from the Cairns Port Authority, the fifth year funding was a Qld Landcare bequest and this year the federal government's Reef Rescue Program facilitated by Terrain NRM in the Wet Tropics region, was the funding source. BCC was awarded grant monies to install sediment measures on the Bonadio's farm. The 1500 seedlings planted this year form part of a vegetative buffer zone which intercepts storm water flow originating from the Seven Sisters. A sediment detention pond will be installed in August 2012 to capture sediment loads and this site on the farm is one of three we will be working on over the next year, including in paddock contour banks and bank stabilisation works. All the works we have undertaken on this farm are a bonus for biodiversity and are part of the overarching Green Corridor project objectives. This work would not have been possible without the commitment of Alan and Ron Bonadio and their families who prepare sites for us, water the trees after they are planted and have become custodians of these vegetated zones. We had become aware that the 2004 TREAT planting along Peterson Creek on our property was far too thin in a number of places. Our planting on 9th December 2011 was a start to address the worst of the narrow section. Reinforce the fauna corridor along Peterson Creek. The site is interrupted by a local high voltage feeder line to neighbouring properties across the creek. As the crossing is almost at the apex of a meander loop it complicates the planting site. Fortunately the powerline runs NNE - SSW, and so the site prepared will actually block the SE wind once the trees start to mature. The planting was made on part of the site to the west of the powerline crossing. An area (strip) some 15 - 20 metres wide has been fenced off along the powerline for grazing by cattle. Some 6 weeks prior to planting, site preparation started by spraying with glyphosate; ripping the soil, more or less along contour lines; and flattening the lumps raised by the rippers with a slasher. A further glyphosate spraying preceded the final work by 2 weeks. Then the holes were drilled with the TREAT auger. The holes were dressed with dolomite and gypsum, and fertiliser was scattered in the holes a day or two before the planting. Simon laid out the trees for planting the afternoon beforehand. We obtained 300 from the Lake Eacham Nursery, as long term active TREAT members, and 150 were raised by Simon at home from locally collected seed. There were 26 different species in the ones from the Nursery and 19 from Simon's stock. There were 11 volunteers planting on the Friday morning, starting at 8am and quite a few of us were then at the Nursery before the last of the morning tea had disappeared. As the soil prior to the planting was quite moist we did not water until just on night-fall, using previously set up irrigation. We did, however, mulch the trees as we planted. We had laid out small bales of hay prior to the planting and each planter used this to mulch as they planted. Some weeks later, there have been some losses. We are not sure why at this stage. Some may have been planted in too wet conditions. None of the trees planted in the better sandy clay loams of the natural levees have died. Most of those that have were in heavy clay loams, in somewhat lower areas, which were wet when they were planted and are still quite wet. Many of the young trees have healthy new shoots showing on them. On the 14th December 2011, 14 planters put in 448 trees and connected the Lake Eacham National Park trees to the March 12th planting on my block, thus connecting the Park to Peterson Creek. This was a significant planting. The trees were planted in blocks down a slope with grass strips between to reduce erosion. In an attempt to determine if some planting and maintenance methods commonly used were actually beneficial, various treatments were and will be trialled. The top block of trees was put in using the TREAT auger, while all the lower blocks were ripped, then cultivated with a rotary hoe to produce a garden bed type soil condition, and then deepened as needed using the auger lightly. The bottom block has 150 trees in 10 rows and there were 5 different treatment combinations to give an indication whether water crystals, chook pellets and soaking in different solutions (such as Seasol or Maxicrop) for up to 20 minutes just prior to planting, have any benefit. In the following days, another 135 trees were planted along Cutler Road and these also were planted using different methods to add to the experiment. Some areas were mulched with grass hay, and some with compost from the local tip. All trees were watered in using about 4 litres/tree as soon as possible after planting. Nine days later this watering was repeated due to the dry conditions. For maintenance, some areas will be sprayed just to remove grass, while retaining the Pinto Peanut to see if a living ground cover that produces nitrogen will benefit the trees: while others will be sprayed to kill all competing plants. Some areas will be heavily mulched and some lightly mulched. One area will be heavily fertilised with Katek Organic Super Growth (enhanced chook pellets), another area heavily fertilised with GF 450 (NPK), some lightly fertilised and some without any fertiliser. Trees were sourced from the Tablelands Regional Council's nursery. They had to be suitable to the area and as many as possible useful for tree-kangaroos as a food source. There were 74 species planted. It must be firmly stated that for many reasons, these experiments are not a scientific trial. However, hopefully there will be good indications to see if some of our planting and maintenance methods have value. In 2003, I was 'issued' a desk job at a small office in Atherton with Terrain NRM as their Education and Training Manager. The office also came with a colleague - Rowena Grace, Terrain's Biodiversity Coordinator for the Wet Tropics. Upon reflecting about the different roads that led us to be sharing that office, we found we shared similar friendships, aspirations and thoughts about restoration efforts across the Wet Tropics. Having both shared similar academic leanings in community development, we agreed that rainforest restoration initiatives were a good story. Years passed and plenty of reports were filed for government about the 'good' works of community across the Wet Tropics, but I always noticed that people working across NRM at reporting time never seemed so enthused about the stories they were telling about the benefit of community to environmental management as when they actually discussed the people and history involved - things that reporting often leave out when one is trying to condense a comprehensive idea into 250 words or less. In 2008 when the federal government announced the Caring for Our Country initiative, though strategic and aimed at greater efficiency of on ground resource management, many across the region challenged the effectiveness of the vision of the new plan as well as how funding would be allocated. Numerous smaller projects and community based initiatives were sidelined from funding as they did not adequately address the topics being presented for funding. Suddenly a rich and diverse cultural legacy of community driven rainforest restoration initiatives came to a halt, and members of the Southern Atherton Tablelands Revegetation Alliance (SATRA) chaired by then TREAT President, Barbara Lanskey, began to wonder how to better tell the story - a legacy of community driven restoration that has developed its own culture across much of the Tablelands. Though I would fight vehemently with anyone who would falsely claim I am anything other than a Tablelander, North Queenslander, my American accent does in fact give me away as an 'outsider'. Yet my understanding and education of this community I call my home was largely shaped by a number of individuals who happened to be the early pioneers of rainforest restoration. Upon arriving to the Tablelands in 2001, I 'stumbled' across a man in his yard while fetching my 3 year old daughter's ball that had gone astray; Geoff Tracey returned the ball to me and inquired where the accent was from. Thus began my own years of 'Tuesdays with Morrie' though in this case it was Geoff and I. I read, I learned. I listened. How fortunate to get an education about the rainforest from such a man of innovation and one of the early pioneers of ALL restoration initiatives across our region. Chasing that ball changed the direction of my life and though always on the course of conservation and education, Geoff's friendship and knowledge shaped my own direction on turning information into knowledge and how knowledge is best deployed (via education) and utilised. Knowledge has to be transformed from being tacit into being explicit. (Nonaka and Takeuchi 1995) Tacit knowledge is not necessarily accessible to others and is often implicit and personal whereas explicit knowledge is accessible to others - it is mostly tangible and brought from the personal into the wider public domain. The inspiration Geoff's knowledge provided, led me to be trained as a Lake Eacham Parks Volunteer by the likes of Joan Wright and Alan Gillanders. Alan was another one of my early 'teachers' and what a blessing to work with him again so many years later in education initiatives across the Wet Tropics. Joan and James introduced me to Landcare and David Leech and Wally Coutts and the Lake Eacham nursery being run by Nigel Tucker and Tania Simmons then. A paid TREAT membership soon followed and one day while learning about seed collection from Helen, a gentle big man was singing my favourite song; Tony Irvine singing Nina Simone (my own daughter named after the great Nina herself). Tony and Helen are cornerstones to the early pioneers of rainforest restoration and his death really woke me up to the transformative learning I had attained from all of these early adopters and pioneers sharing their knowledge and how much was being lost with the death of our own 'elders' from this movement. When my own daughter said to me a few years ago "mum, I didn't know Geoff was so into trees" (in reference to Geoff Tracey), I committed to finally documenting a true legacy of community restoration efforts. Barbara Lanskey's and Frans Arentz's vision and support provided the initial seed money to instigate such a project. Through a generous bequest donation from TREAT member Margaret Van, Rowena and I were able to secure Sarah Scragg to lead the project to make a DVD focusing on the Cultural Legacy restoration initiatives have driven across much of the Wet Tropics. Sarah did an exceptional job capturing the words and images across a wide spectrum of early pioneers. Peter Stanton and Rosemary Hill shared again their passions for the Wet Tropics and were so generous in sharing their knowledge and really building the foundation of 'our' restoration history and the vital role of community in protecting and preserving the Wet Tropics. I have often feared the brilliance of Dr. Hill over the years but was reduced to tears when I first viewed her historical account of how the Wet Tropics came to be listed as World Heritage in 1988; how Peter so eloquently described the partnerships formed between government (Parks) and community for the ongoing establishment of TREAT and how this partnership alone has transformed the landscape of much of the Tablelands. An enduring partnership largely because of the visionary aspirations of two great men (and their families) and the opportunities they founded by being selfless leaders and early pioneers. In the process of storyboarding the DVD for Sarah, Rowena and I were captivated by how many truly great 'historians' made themselves readily available and spoke with such passion about their own involvement as well as the roles other individuals had played in developing the culture of restoration across parts of the Tablelands. We were struck by the diversity of stakeholders from the passion of farmer Carolyn Emms speaking of restoration efforts for biodiversity outcomes, to the contagious joy expressed by Alan Gillanders when he noted that anyone with an interest in the environment was in the City of Oz on the Atherton Tablelands. His words alone inspired me to take a walk along Peterson Creek that day in search of tree-kangaroos and in honour of the amazing efforts the Lower Peterson Creek Landcare Group and TREAT have made in transforming the waterway. Sarah's work and ability to capture such a vital role restoration has played can not be underestimated; she devoted many unpaid hours to telling our story and the final product is a result of many community members' passion for storytelling and Sarah's talent at shaping such diverse stories into one narrative. Though reporting may still, at times, be bothersome and difficult to capture the impact of what has been achieved, the DVD aims to be used as an open access resource to all community groups to use to better define and tell 'our' story to those unfortunate enough to live elsewhere. Copies (for $10) can be obtained from Sarah Scragg at mail@sarahscragg.com and from TREAT at the Lake Eacham nursery. 2011 has seen the Wet Tropics Management Authority's (WTMA) Caring for our Country project (which we introduced to you in TREAT's Storm Season 2010 newsletter) get up and running on the Southern Atherton Tablelands. Two of the TREAT plantings this season will be contributing to this project. The beautiful misty mountains of the Wet Tropics World Heritage Area are home to an amazing array of plants and animals, many of which are found nowhere else in the world. Unfortunately, clearing of land to make way for towns and farms has left some of these unique animals stranded in small fragments of forest. Rising temperatures and possible changes in rainfall patterns are likely to increase the stress on our upland specialists (like tree-kangaroos, golden bowerbirds and several species of ringtail possums), forcing some species to retreat to higher areas. However, limited connectivity in the landscape is a significant barrier to natural migration. Increasing habitat and restoring connectivity in high-altitude areas will assist this natural migration and increase the resilience of the Wet Tropics to climate change. Climate modelling by Dr Luke Shoo at James Cook University (JCU) identified areas which would provide the best cool refugias. The Making Connections project is focused on improving connectivity in these areas, specifically reconnecting the block of remnant forest on private properties in the Upper Barron / Mount Hypipamee outlier to Herberton Range NP, and improving the connection between the Herberton Range NP and Malaan NP across the East Evelyn Gap. Keith Smith, Senior Nature Refuge Officer at DERM has been negotiating with landholders in the target areas to negotiate on-ground works. The response has been very encouraging, and there's potential to do more work than the project's budget ($600k from the Australian Government's Caring for our Country initiative) will be able to cover. The project kicked off with Tablelands Regional Council's (TRC) Community Revegetation Unit and Conservation Volunteers Australia (CVA) volunteers and National Green Jobs Corp teams planting two hectares at John Hatton's property on Kenny Road (Upper Barron) in February and April. Despite the dry winter, the plantings survived well. The Tree Kangaroo and Mammal Group (TKMG) received a $20k Community Action Grant to help widen a narrow corridor on the Emms' property further down Rock Road, and this was planted by TRC, CVA and TREAT in early 2011. The WTMA-CFOC project will help to widen this further in 2012, with TRC and CVA preparing the area for planting at the end of February. A new fence to protect the plantings has already been put up. The Department of Transport and Main Roads put some money into upgrading the wildlife underpasses at East Evelyn (below the lookout) with assistance from TRC and Biotropica, and the CFOC project is funding some weed control in the areas leading into the underpasses. A second connection will also be established with the support of landholders to the west of the tunnels. Work has recently commenced to design and set up Pasture Conversion Plots, with initial funding and assistance from CVA. Through Griffith University, Professor Carla Catterall and Kylie Freebody have begun the process of plot installation, initially at Cloudland Nature Refuge, with Ringtail Crossing Nature Refuge under consideration. Dr Luke Shoo (University of Queensland / JCU), with assistance from CVA and the Centre for Rainforest Studies, has established plots at Cloudland NR and the Emms' property for microhabitat trials, installing piles of logs and old fence posts in recently revegetated areas, to encourage faster colonisation by reptiles and insects. The project was formally launched in August by Peter Valentine, Chair of the WTMA Board, with a ceremonial tree planting involving project partners and landholders. Many thanks to Kim and Brad Eaton for their hospitality. The focus in early 2012 will be on planting, with 4 hectares planned at the Emms, Eaton, and Hofmann properties. New fences have been put up to protect the plantings and TRC has been in to spray the areas. TRC and CVA will be preparing the sites for TREAT community planting days on Saturday 28 January 2012 (Eaton's) and Saturday 18 February (Hofmann's). We hope to see you there! The third family of trees which are important to revegetation of rainforest on the Atherton Tablelands is Myrtaceae - Lilly Pillies, Satinashes and Myrtles. Once again this is an ancient family with a huge and important role in Australia's vegetation. Myrtaceae is well represented in the remaining rainforest fragments in the Wet Tropics but is much more widely known across the dry areas as the eucalypts, melaleucas and callistemons also belong to this family. There is credible evidence to suggest that the hundreds of species of eucalypts and related genera which cover most of this land all evolved from ancient rainforest species similar to our present day rainforest Myrtaceae members. Ranging from small shrubs to huge trees, they produce nectar- rich flowers with rounded petals holding many fluffy stamen and mostly fleshy fruit in large quantities to feed birds and animals. Cassowaries eat many of the large fleshy fruits and humans find some palatable too. There are around 160 species in 38 genera in the Wet Tropics and here I look at 8 in more detail. This tree can grow to 20 m but is more commonly part of a shrubby understory especially on the edge of rainforest. It is very attractive with a compact shape, small shiny pointed leaves and slender arching orange stems. It produces, sometimes profusely, cream to apricot flowers which in turn become small black shiny fruit with several seeds enclosed in green flesh. It grows in most types of rainforest across the Tablelands and is useful on edges where it stays leafy to the base, helping to create the closed edge required to keep weeds out. New bark is a distinctive orange colour helping identification. Once again, a bushy tree to 10 m. It is densely leafy which lends itself to closing in the edge space. New leaves have a purple tinge and white hairs along the veins with branches forming a more upright structure than either the pilidiostigma or the rhodomyrtus. The name 'sessiliflora' refers to the flowers/ fruit having virtually no stalk. The fruit are small, round and black once fully ripe with many small seeds inside. Seedlings germinate quickly but need plenty of water. Another useful edge species. Compact and bushy up to 10m with an arching shape and rusty brown new growth. One can imagine the effect of using these first three species together interspersed with some pioneers for height and it creates a great solid edge to plantings. Another good thing about these three is that birds adore them for both flowers and fruit. This one is a particular favourite of the Golden Bowerbird in upland rainforest. The creamy white fruit are produced continually throughout late summer, autumn and winter making it an important food source during times of scarcity. The many seeds inside are tiny and are best processed by pushing the fruit through a coarse sieve then washing the pulp through a fine sieve before mixing with sand to make it easier to spread them out when sowing. They germinate easily and are often found as natural recruits in replanted areas. This beautiful tree can grow to 30m with simple leaves and a dense crown. The new leaves are bright purple making it easy to identify when young. Mature trees are more usually identified by the large lumps and bumps on the trunk which give it its common name. These bumps are where the flowers and fruit are formed creating the unusual feature called cauliflory. It is quite a spectacle to see flowers forming all the way up from the base of the trunk to the top and it is unique to a handful of trees in tropical rainforest. This feature also makes it easy to watch the many birds, especially honeyeaters, and small mammals such as pygmy possums which enjoy this rich food source. The golf ball sized fruit is not so palatable but is beautiful to see being white with a pinkish tinge; the amount of pink varies from tree to tree. The fruit contains a single large seed which is quick and reliable to germinate. It grows in most forest types throughout the Wet Tropics but prefers rich well drained soils. This is one of the larger trees in the forest growing to 40m. Leaves are similar looking to the Bumpy Satinash being simple, shiny and dark green, with the new growth an orange/red colour. The trunk also has a reddish bark which stands out particularly after rain. Mature trees grow adventitious roots out of the trunk up to a metre from the ground; the reason for these roots is not clear. The fruit can be as large as cricket balls but are generally smaller with a greenish brown leathery skin wrapped around a huge cream coloured seed. Native rats love to eat the leathery flesh, gnawing away part of the seed at the same time. The tree appears to have responded by sinking the radical (first root) and the growing point deep into the seed so they don't get damaged. These are again easy to germinate but because of the size of the seed and the tap root it sends down, it makes sense to sow them straight into pots rather than a seed tray. A large tree with a dark shiny crown of simple leaves, the main distinguishing feature being the trunk with its orange papery bark which flakes off like a melaleuca. Very few trees in the rainforest have this feature making it very easy to identify. Most years mature trees produce large amounts of cream flowers followed by the most vibrant purple, almost bell shaped fruit about the size of a strawberry. The bright white flesh underneath seems to shine through adding to the vibrancy. Some years the floor under the tree is carpeted by fruit which is a fabulous sight. The single seed is quick to germinate but slow to grow in the pot. This tree can grow to 30m but is very slow growing. Most of the time there is nothing particularly noticeable about this tree but during wet periods it puts on a spectacular show producing a flush of new growth all over in hot pink fading to pale pink, standing out like a beacon in the forest. The leaves droop downwards accentuating the display. The fruit by contrast are small and hidden under the leaves, they are matt and purple in colour with the typical dry flesh and single seed of the genus. Once again they germinate easily but are incredibly slow growing right from the start. They grow in most forest types on the Tablelands. Related to the familiar Golden Penda which grows as a shrubby tree on the edge of creeks and flowers so prolifically under cultivation, this tree is however one of the forest giants rising to 40m. Despite its common name, the flowers are a similar yellow to the Golden Penda with the 'red' part referring to the colour of the timber. Mature trees can go for years without flowering before suddenly all of them flower together in response to a stressing event such as a cyclone. Mass fruiting follows so those involved in revegetation have to make the most of such abundance. It is found across the Wet Tropics. This gives just a taste of the species within the Myrtaceae family used in revegetation. Most grow well, if generally slowly, under nursery conditions. They generally perform well in the harsh conditions of an open planting although they can be attacked by insects and get a little sunburnt, but these rarely kill them. Find out which ones are right for your area and make the most of their beauty. Seed collections have finally started to improve after poor pickings for most of last year following Tropical Cyclone Yasi. While there is currently an abundance of some fruits such as Guioa lasioneura (Glossy Tamarind), Xanthostemon whitei (Red Penda) and Syzygium austale (Creek Cherry), other species which would normally be available at this time of year are very scarce. Terminalia sericocarpa (Damson Plum), Alstonia scholaris (Milky Pine) and Euroschinus falcata (Pink Poplar) are extremely hard to find this season and others are not available at all because they either haven't flowered, in the case of Syzygium cormiflorum (Bumpy Satinash), or possibly through losing flowers or young fruit in extreme weather conditions. It is also possible that following Cyclone Yasi, in some areas there may have been insufficient pollinators available for some species which flowered but failed to produce fruits. All in all it looks as though we will still be able to collect enough variety to ensure good supplies over the next season or two. The planting season is just around the corner and with large community plantings set for every Saturday from late January through until the end of March we are all going to be very busy. If you have applied to TREAT for trees for your own plantings please ensure you give the nursery a call at least a week or even 2 in advance as to when you would like to collect your trees. Hopefully the current La Nina conditions will start producing some ideal weather for tree planting before the end of January.